Two Montreal ravers slashed the tires of a dozen cars parked on Des Pins avenue yesterday night, convinced that cutting rubber was the key to social revolution. "We need to start over, to wipe away the existing political order and create something entirely new." said Tom D., one of tire thrashing protesters. "I now realize that the only way we're ever going to free ourselves from our political oppressors, from those who rule over us, is if we knife a bunch of parked cars. People need to wake up to the fact that they're slaves to the rich, and that will only happen once all their cars have shredded tires." David G., Tom's comrade in arms, agreed. "Voting doesn't change anything, but stabbing a rubber wheel with a seven inch blade? That's political reform. Everyone is so complacent, so ready to follow our political leaders off a cliff." 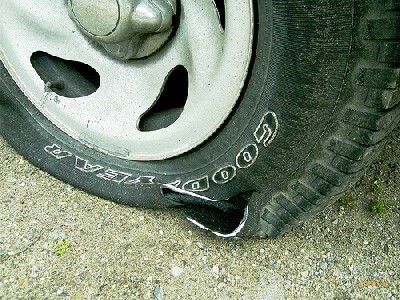 The two vandals told Rave News that they won't stop with slahsing tires. Tom and Dave are ambitious young men with an eye on the future. "Tires are just the beginning. We're not stupid. We realize that eventually, we'll have to branch out. That's why Tom's starting a drum circle, while I plan on smashing windows in addition to slashing tires. We call it the Tire, Window, Drums three path plan to future prosperity. Slash tires, smash windows, beat on drums. That's how we're going to change the world, man. It's going to be epic." Tom and Dave's plan for political reform isn't without its detractors. Elaine, a high school friend of the pair, was less than impressed with what the two have been doing. "Ever since those guys took that intro to politics course at Concordia, they think they have all the answers. They don't. No one's going to change the world by destroying private property or by banging on drums. There's only one path to meaningful political reform, and that's by arguing with strangers over the internet." The raving vandals shrug off critics like Elaine. "That's, like, just her opinion man," said David. "History will show that we know what we're doing. One day, people will erect statues of us."